TRY OUR BEEF! Review your freezer and mark what you'd like from our list. Our beef is pasture fed all the time, and they also have choice of grain. They are hormone-free and antibiotic-free, so pure and ready for human nutrition! Wesley will bag it for you and even deliver it to one of our CSA DROP LOCATIONS or Market stops! We will send you directions if you need when you order, just ask us! He will gladly accept cash, or credit cards! If we are out of something, he will communicate that to you as well. All beef is vacuum sealed, labeled and frozen for safety. We will get as close to the weight as you request, but know that all beef is already cut, and packaged so weights vary- just like at the supermarket. Contact WESLEY at 567-674-4161 to arrange for your delicious beef cuts. We are raising cattle! The beef will be sold by the quarter, the half or a whole. Wesley will also have some beef cuts available at the market! All of the cattle are raised with NO steroids , and NO hormones. They are being sheltered in the barn for winter and are in the pasture during spring, summer and fall. A whole beef will average 500-700 pounds of meat. 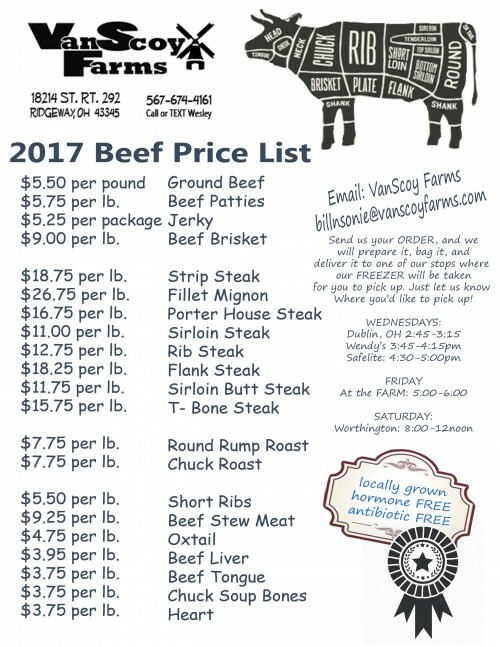 Contact WESLEY if have questions or if you would like to reserve your beef for the next round.